First off I would like to begin with I am 100% new to Linux. With that being said I am not new to computers so I do have a fair amount of troubleshooting knowledge. I will try to give a short to the point description of what I have done. Booted without issues but no wifi, opened the additional drivers panel to see the driver for wifi was turned off. Every time I click to use this driver and apply it hangs about 30% of the way through and will not continue. Laptop itself is not frozen as I can still do anything including cancel the installation. A Google search shows that it's a common error with no solid, sure fix suggested. Therefore, I suggest that we try some things to see if we can overcome it. If your router is capable of N speeds, you may have better connectivity with a channel width of 20 MHz in the 2.4 GHz band instead of automatic 20/40 MHz, although it is likely to affect N speeds. I also have better luck with a fixed channel, either 1, 6 or 11, rather than automatic channel selection. In your case, your router is at channel 4 where there is considerable overlap; I suggest channel 11. Also, be certain the router is not set to use N speeds only; auto B, G and N is preferred. After making these changes, reboot the router. Use nano or kate or leafpad if you don't have the text editor gedit. Proofread carefully, save and close the text editor. 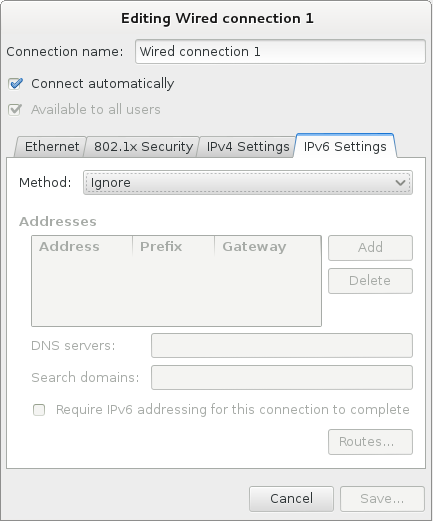 Next, I'd set IPv6 to Ignore in Network Manager: http://docs.fedoraproject.org/en-US/Fedora/18/html/Installation_Guide/images/netconfig/network-connections-ipv6-ignore.png This example is for ethernet, but you want wireless. Reboot the computer and let us hear your report. Not the answer you're looking for? Browse other questions tagged drivers wireless live-usb or ask your own question. My wireless/WiFi connection does not work. What information is needed to diagnose the issue?